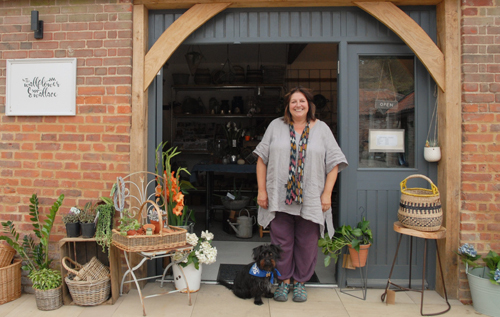 A Norfolk businesswoman has made a career change at the age of 56 by opening a floral design and artisan shop in Heydon. Karen Wheeler and Wallace outside The Wallflower & Wallace, Heydon. Karen Wheeler from Mileham spent 17 years working as a mental health nurse and National Health Service manager. Although she enjoyed her career in healthcare, the role eventually became too stressful and began to affect her wellbeing. So, in 2017 Ms Wheeler decided to hand in her notice and take some time out to focus on her own health. Shortly after resigning, she adopted Wallace – a rescue dog from Cyprus – and spent weeks walking Wallace in the countryside and tending to her garden, feeling like a wallflower. Following a period of self-imposed isolation, Ms Wheeler eventually felt ready to tap back into her creative talents that had got lost while working long hours in her former profession. These helped to boost Ms Wheeler’s confidence and self-belief, and soon she had her sights set on becoming a self-employed florist. Fortunately, her brother-in-law, Paul White, who owns Husk artisan bakery in Heydon, told her about the newly renovated business premises at Church Farm Barns and it was not long before she found herself in a meeting with the Heydon Estate: she knew immediately the village would be a perfect location for her new venture. Following several months of planning and preparation, The Wallflower & Wallace floral design and artisan shop opened in May. 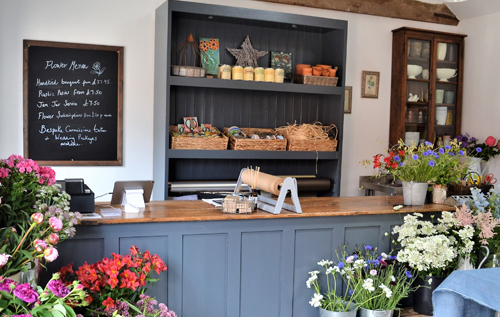 The eclectic store sells mostly seasonal, locally grown flowers and Ms Wheeler offers a full floristry service. The shop is also stocked with a curated collection of house plants, cacti and succulents; terrariums, pots, planters and baskets; paintings, prints, ceramics and sculptures; gifts and cards; together with some vintage items for the home and garden. The Wallflower & Wallace also sells the work of local artists and is a stockist for Dassie Artisan, Handmade Candle Co, IzzieRainey, Nkuku and Nutscene, and offers a range of workshops for individuals and groups with no previous experience. When they arrived in Heydon, Ms Wheeler and Wallace received a warm welcome from residents and other local businesses, and they quickly felt an integrated part of the community.